CARFAX 1-Owner. PRICE DROP FROM $45,995, $10,400 below NADA Retail! 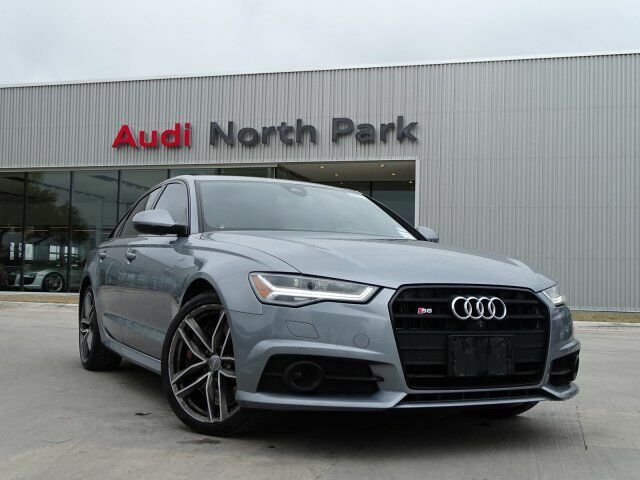 Heated Leather Seats, Moonroof, Nav System, Rear Air, All Wheel Drive, PRESTIGE PACKAGE, DRIVER ASSISTANCE PLUS PACKAGE, LAYERED ALUMINUM/BLACK WOOD INLAYS CLICK NOW! PRESTIGE PACKAGE Power Rear & Manual Rear Side Window Sunshades, Open & Close Power Trunk, LED Interior Lighting, Bose Premium Surround Sound System w/AudioPilot, Head Up Display, LED Headlights, S6 SPORT PACKAGE Sport Exhaust w/Black Finishers, Quattro Sport Rear Differential, Audi Dynamic Steering, DRIVER ASSISTANCE PLUS PACKAGE Audi Active Lane Assist, Adaptive Cruise Control w/Stop & Go Functionality, Audi Pre Sense Plus, High Beam Assistant, Top View Camera System, distance sensor, BLACK OPTIC PACKAGE Wheels: 8.5" x 20" 5-Double-Spoke Titanium Matte, Tires: 255/35R20 97Y XL Summer, High Gloss Black Pkg w/Exterior Body Color Mirrors, LAYERED ALUMINUM/BLACK WOOD INLAYS, AUDI GUARD PROTECTION KIT Audi Guard Cargo Mat Durable trunk liner w/S6 logo, Audi Guard All-Weather Floor Mats (Set of 4) Black rubber floor mats w/S6 logo. MP3 Player, Sunroof, All Wheel Drive, Remote Trunk Release, Keyless Entry, Child Safety Locks, Steering Wheel Controls. Non-Smoker vehicle.